WHC is a business management and technology consulting firm serving North America, Africa and Asia. Are you a Greater Baltimore area Entrepreneur with a desire to accelerate your business growth? Are you looking to network with other passionate entrepreneurs and business leaders to drive your topline business results? In business for 2+ years / have 2 + employees / have $100k in annual revenue? 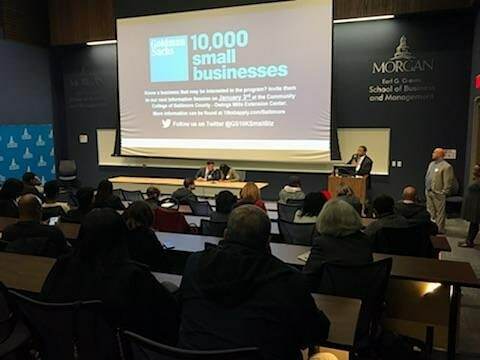 Please join Community College of Baltimore County, Johns Hopkins University, and Morgan State University as we host an Information Session for the Goldman Sachs 10,000 Small Businesses Program in Baltimore. Hear from Program Alumni who will share how 10,000 Small Businesses helped them create a roadmap to growing their businesses. Convening in the First Floor Auditorium (room 104). Refreshments will be served in the Atrium. Event will begin at 6:00 pm and the program will start PROMPTLY at 6:30 pm. Parking: From Hillen Road, turn onto Argonne Drive (see yellow arrows on map), turn left onto Stadium Way and make a left at the Morgan Commons Parking Garage. Take a ticket when you enter, we will provide you with a voucher at the event. The garage is connected to the Student Center, follow the bridge to the student center. Exit the student center, make a left and follow the path towards the bridge. Walk across the bridge over Hillen Road (see red arrows on map). Enter the Graves School of Business and Management on the 3rd floor at the check-in table. Money Basics- What Young People Need to Know!